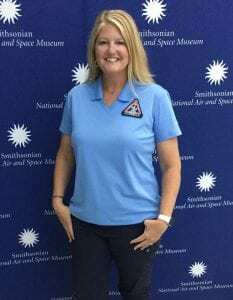 I’m so thankful that Leslie shared her expertise on designing a guided inquiry lesson with our teacher group in DC this summer. It changed my pedagogy and student engagement. I’m a veteran teacher, trained in 3D science by the best in the state, and a state teacher of the year finalist. Yet, here I am, still learning and loving it! What would I have done differently? The students would have researched and read more informational text. Other than that, I really loved this unit and how it turned out. The final piece is wrapping up 3D Science, natural phenomenon, story lines, and guided inquiry into a stellar lesson. If you use NASA’s 5E lesson planning, it easily plugs into GID’s template for student driven learning. Plugging in 3D Science is a natural process in GID as well. The Disciplinary Core Ideas are the science concepts that the students are making sense of. In conclusion, SEP’s and CCC’s are a part of a student’s toolkit to dig deeply into the phenomenon that they are making sense of, and are easily incorporated into the guided inquiry process. Thank you for letting me share this week what I’ve learned about guided inquiry design and how it was implemented this year. What fifth grader doesn’t love animals and the great outdoors? 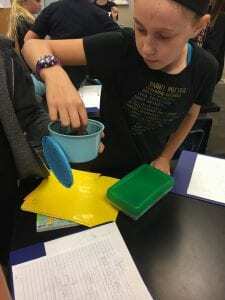 We started the year with Matter Moving through Ecosystems (NGSS 5-PS-3, 5-LS2-1). IMMERSE- We discussed times they have found “roadkill” and what would that look like in four days, four months, four years. As scientists, we observe, record, and question. 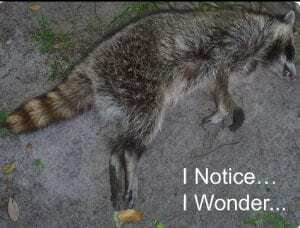 I asked them how they could observe the raccoon to answer this question. In teams, they came up with all kinds of solutions, and we came to a consensus to use time-lapse video. 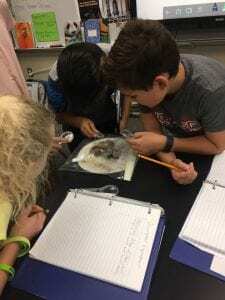 (Phenomenon)– We found a video of a decomposing badger that was roughly the same size. The class watched the video (a few times) while recording observations and questions. 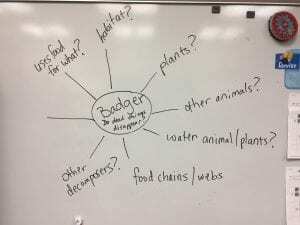 We came back as a large group and shared observations and questions: Why did the birds come, why did the badger seem to heave, why were bones and fur left? 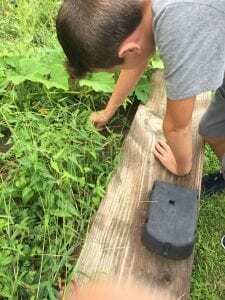 They were surprised by how quickly decomposition occurred. https://youtu.be/E93rNE5F-LE We came to a consensus for our driving questions. 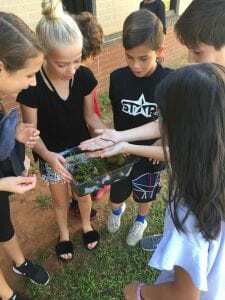 This spring-boarded topics of conservation of matter, life cycle of a fly, uses of food for organisms, movement of energy and matter through food webs, and decomposers. 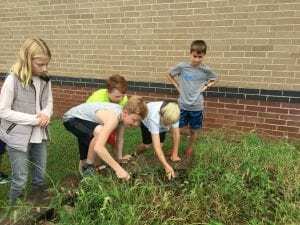 How do plants and water organisms decompose? 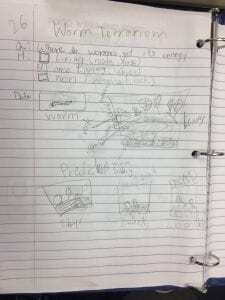 Does matter decompose in space? 10 year-olds have lots of questions when given an opportunity and time to think. IDENTIFY- Students divided into teams based on similar questions, and I provided resources for their experiments and research. 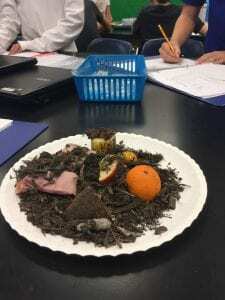 GATHER- Students explored matter decomposing in different types of soil, plants decomposing, worms as decomposers, decomposing bones (this group had to find out what happened to the bones and fur from the badger). 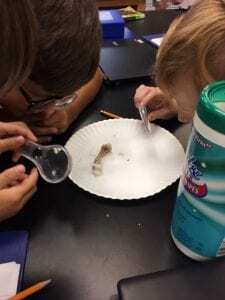 CREATE– Students used their research, observations, and hypotheses to create an experiment to model decomposition in action. SHARE– Sharing is always our favorite part. Fifth graders love to share in front of their classmates! Teams made posters to explain their decomposition project and model the process, along with displaying their physical project. 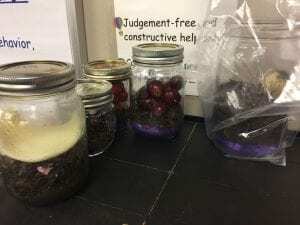 EVALUATE- We had some surprises, such as, the fruit never decomposed in a sealed jar, which encouraged students to find out why. We had gnats get into some containers. The soil was a little richer with tubs containing worms. The worms did die quickly and disintegrated. Oh my goodness, their projects carried over to their homes or vacations. Parents sent me pictures of their child finding fungi or looking under rotten logs. 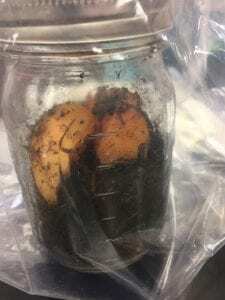 My students still bring me leaves with fungi roots. 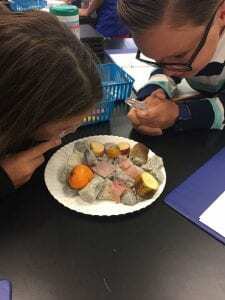 The beauty of Guided Inquiry Design IS the organized framework for your students to OWN their learning, think more deeply, and collaborate with classmates. Friday will be a reflection of students incorporated Science and Engineering Practices and Crosscutting Concepts while gather information to answer their questions.